Camping: Yes. Rollingview Recreation Area at Falls Lake. Reservations: 1-877-7-CAMP-NC (722-6762) or go here. $25. Land managers: N.C. Division of Parks & Recreation, N.C. Wildlife Recreation Commission, U.S. Army Corps of Engineers. Note: Some or all of this trail is on gamelands and hunting is allowed. Learn about local hunting seasons here. Trailhead/Access: Santee Road and Rolling View Recreation Area. Click on map below for specifics. Camping at the eastern trailhead makes this stretch part of a backpack option when the seasonal campground is open; its western terminus in the middle of the Little Lick Creek bridge offers a rare panoramic view from the Falls Lake Trail. In between is nearly 4 miles of typical Falls Lake scenery — with a twist or two. One of those twists comes at about the midpoint: a bluff that looks out over the lake. About a mile from Rollingview there’s a notable descent that might, for the moment, put you in mind of hiking downhill in the Appalachians. 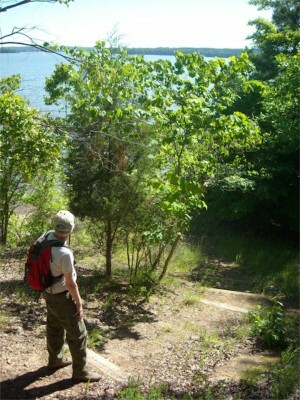 You’ll find more mature forest here than is typical along Falls Lake, and the trail enjoys some especially scenic stretches along the lake. Note that the trail follows a thin slice of public land on Section 12 that treads close to private property. Stay on the trail. Geology Highlights: A sandstone cliff along the lakeshore and a traceable line (dike) of diabase rocks are geological highlights of this trail section. The cliffs are parallel to the former channel of the Neuse River. Within view of a graveled road, L, the Falls Lake Trail turns R as it starts to parallel the road. Soon cross the opening of a drainage pipe and eventually make a second R to leave the road. Cross a roadbed, coming from a residence. Soon start to walk by the lake shore, R.
Cross an overgrown roadbed and soon a possibly, dry creek bed. Reach another old roadbed. Cross it and veer towards R to stay on the trail. Pass some trail signage and veer to the L by a residence. Soon start to walk near, but above, the lake shore. Reach a gravel road (private) as the trail turns R to follow it. After the road goes over the dam of a small pond, L, turn R to reenter the woods. The trail crosses a narrow path. Cross another roadbed, with a blue-blazed connection (0.1 mi L) to Santee Road. Cross under a power line. Exit woods and reach another power line by a gravel roadbed (L 0.2 mi is Santee Road). Stay R to cross Little Lick Creek on a large footbridge (Note the landscaping on both sides).